April 25 is the birthday of Édouard-Léon Scott de Martinville (April 25, 1817) , a French printer and bookseller, who invented the earliest known sound recording device, the phonautograph. Suggested celebration: Birthday cake with a glass of French wine while listening to Au Claire de Lune (believed to be the voice of Leon Scott) - soundtrack courtesy of First Sounds. 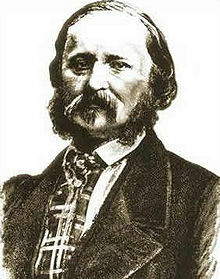 "Édouard-Léon Scott de Martinville (25 April 1817 – 26 April 1879) was a French printer and bookseller who lived in Paris. He invented the earliest known sound recording device, the phonautograph, which was patented in France on 25 March 1857."